Union armies were defeated on July 21 in the first major battle of the Civil War. 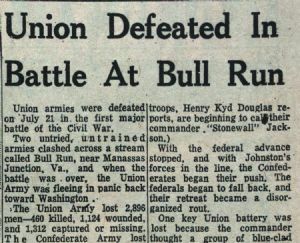 Two untried, untrained armies clashed across a stream called Bull Run, near Manassas Junction. Va., and when the battle was over, the Union Army was fleeing in panic back toward Washington. The Union Army lost 2,896 men—460 killed, 1,124 wounded, and 1,312 captured or missing. The Confederate Army lost 1,982 men — 387 killed, 1,582 wounded and only 13 captured or missing. Brig. Gen. Irvin McDowell has been heavily criticized in the press, despite the fact that he warned before the battle that his troops were not yet ready for combat. Also coming in for a large share of the blame is Maj. Gen. Robert Patterson, recently commander of federal troops in this county, who failed to intercept Confederate forces led by Gen. Joseph E. Johnston. Johnston reinforced the Confederate armies at a critical point in the battle, and may have turned the tide. McDowell’s plan was to cross Bull Run on his left, and strike the Confederates from the side, while keeping them pinned down in front. With the federal advance stopped, and with Johnston’s forces in the line, the Confederates began their push. The federals began to fall back, and their retreat became a disorganized rout. One key Union battery was lost because the commander thought a group of blue-clad Confederates were his relief. He realized his mistake when they opened fire on him at point, blank range. A great deal of the panic was communicated to the soldiers by* retreating picnickers from Washington. D. C. who had come to watch the supposed federal victory from a safe distance. As the Confederate advanced, they fled back to Washington in utter panic.